Love ironing?? I hate ironing but this is something completely different. Extreme ironing is a fairly new sport where people take their ironing board and do their ironing in extreme places, such as the top of mountains or whilst sky-diving. We have chosen a local wreck called the Longbenton about 4 miles off Mappleton Village and will be joined by Hornsea Rescue who will witness the event. We will also take some underwater photos as proof. 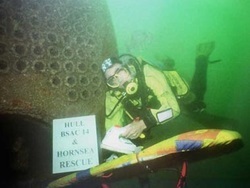 Hornsea Rescue is an independent voluntary organization and plans to relocate to new premises in 2004. The local council has gifted some land and now Hornsea Rescue has to raise funds for the construction of the new facility. The building will not only include a place to keep the boat but classroom facilities for educational and conservation projects. We chose a local wreck called the Longbenton, a 211 ft long 924-ton steamer torpedoed by a German sub in 1917 whilst being used as an Admiralty colliery vessel. It lies about 6.5 miles S/E of Hornsea in 16- 20m of water. We planned to dive on a low water spring tide to optimize light penetration for photography. It was a lovely sunny day and the sea looked calm but was deceptively bumpy further out. There was a slight southerly wind blowing and the forecast was for the wind to increase later in the day. Two ribs, Stray Lass and Skippy 2 set off from Hornsea's excellent new public boat compound and slipway. 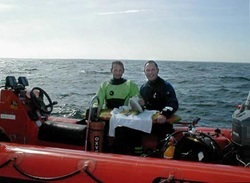 Skippy 2 enabled 4 other divers to join us and also provide critical surface cover. We arrived at the dive site just after 1.00pm and dropped a shot line near the wreck as planned. Ian bounced down, unclipped the shot and tied the line onto the wreck's boilers at a depth of about 12m, then sent the shot up on a lifting bag and returned to the boat. We clipped the heavily weighted ironing board; iron, club notice and 'ironing' onto the shot line and I escorted these down the shot line to stand it on top of the boilers. I waited there with the ironing board for Simon & Ian with camera in hand. The other divers were previously briefed about the wrecks layout, entered the water and commenced their exploration of the wreck. Ian took a series of photos of me ironing on top of the boilers, and then we dropped down to the seabed with ironing board for another series of photos. All the film had now been shot, so we had a quick fin around the wreck by which time I had clocked up a dive time of 50 minutes. We sent the ironing equipment up to the surface with a lifting bag and hauled it back onto the boat and set of for Hornsea. To my amazement everything went according to plan, which was a great relief. The other divers who had not previously dived off our coast before were equally amazed at the quality of this shallow wreck and the abundance of marine life present. 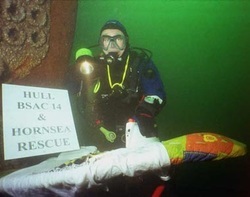 The event raised good publicity for sport diving and Hornsea Rescue in the local press and Radio Humberside interviewed Ian on the day of the event. We have had a tremendous response from sponsors who thought it was a very worthy cause and something completely different. Some sponsors thought we were complete 'nutters' (which is perhaps a key quality for those who choose to dive in the North sea). A big thank you to the staff at Hornsea compound, John and Skippy 2 for providing valuable surface support and to all those people who sponsored the event, which will raise over £1500 for Hornsea Rescue.